The generalisation that the English experiment with their shirts and the Italians with their jackets broadly holds, particularly in business wear. 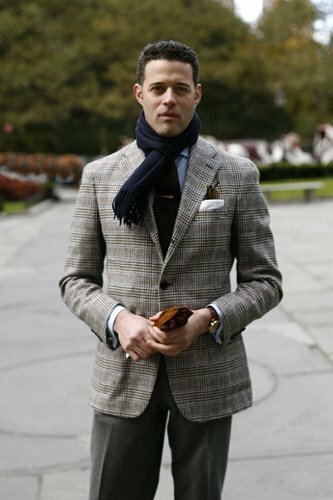 While the English tradition of checked and plaid wools is a fine one, it was always largely restricted to the country (or at least the weekend) and has died out slowly as fewer English men wore suits casually. The Italians are more willing to experiment with suit cloth at every occasion. This necessitates a shirt and tie combination that makes no attempt to compete with that cloth – the Italian Background. The combination works well because a blue shirt suits most people more than white, and it fades more into the background; because a dark tie fades more into the background than a pale tie; and because the dark blue tie is the most similar in tone and harmonious combination with a blue shirt – without being too similar and evoking tone on tone. But this is analysing the obvious. It works as the plainest and yet most sophisticated of supports to an otherwise daring suit pattern – or indeed odd jacket. It equally supports an adventurous pocket-handkerchief, gloves, hat or jacket. 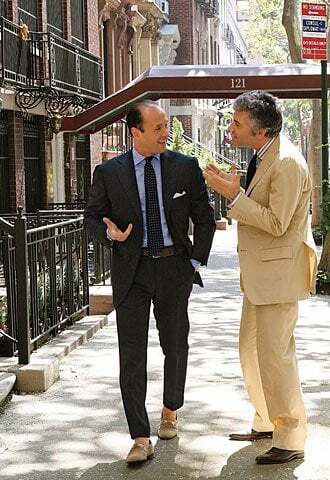 When trying to balance an outfit, the Italian would much rather tone down a tie than go without one. Four examples are displayed here, all courtesy of The Sartorialist. The top one brings out a particular aspect of the Background – its fruitful combination with beige or tan. 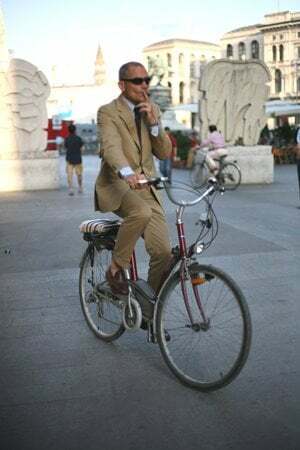 The gentleman on the bike shows that the Background is the best choice for what could otherwise be a very hard suit to find combinations for. You can follow the discussion on The Italian Background by entering your email address in the box below. You will then receive an email every time a new comment is added. These will also contain a link to a page where you can stop the alerts, and remove all of your related data from the site. Hmmm . . . Well, I’ll soon have two colors of blue shirt. I guess I really should go buy a good dark blue tie. The gent on the bike is so cool, wearing that cotton(?) suit with such louche comfort.